For rhythm bands, here is a nice instrument to start with. It is like maracas, but you could also call these rhythm shakers. These are a great addition to any musical band. You will need a parent to assist you with making these as hot glue is involved. Have fun making and playing your new instrument! 1. Place small pebbles or beans in a small container...such as a cottage cheese container or sour cream container. 2. Insert a pencil or stick or popsicle stick into the bottom of the container. Have an adult secure to the inside of the cup with hot glue . 3. Have an adult hot glue lid on. 4. Paint to decorate the instrument. 5. 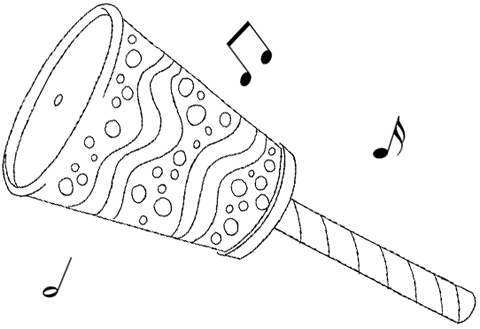 Play this instrument by holding a stick in the left hand and tapping the carton with the fingers of the right hand.